*Please join us for our monthly Taizé Prayer Service this next, January 9, at 8:15pm. Now in our 9th year, we have met each month to pray for Christian unity in our community and in the world. All Christians are warmly invited; invite your friends! * Religious Freedom Day is January 8. Please join the Knights of Columbus, Rappahannock Assembly as we observe the 240th Anniversary of Thomas Jefferson’s drafting of the Act of Religious Freedom for Virginia. 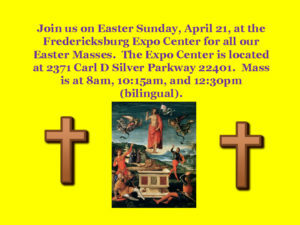 Parade begins at the VRE station at 1:30pm followed by a ceremony on Kenmore Avenue at the Religious Freedom Monument. * Please plan to join us for Mass with Bishop Michael Burbidge on Tuesday evening, January 17. Greet our new Bishop, reception to follow the Mass in the Parish Life Center. * Complete some of your holiday shopping by purchasing SCRIP gift cards! Set up an account today and earn rebates for HCA. 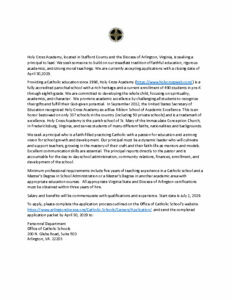 Email Torie Baldwin at scripcoordinator@holycrossweb.com for the school enrollment code. * Saint Mary Calendars are now available in both English and Spanish in the vestibule of the church. Please, one per family.